Temecula Valley Winery named California Winery of the Year! We were so excited to learn that our very own, South Coast Winery Resort & Spa, has once again been named California Winery of the Year for an unprecedented 4th time! 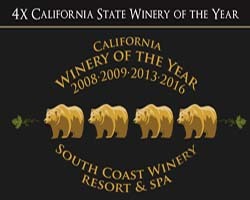 Sacramento has just released the results from the nation’s oldest and most prestigious wine competition, and Southern California Temecula Valley’s South Coast Winery Resort & Spa has been named the 2016 California Golden State Winery of the Year. Records were broken this year at the California State Fair Commercial Wine Competition as South Coast Winery was the first and only winery in the competition’s history to be presented with a four-time championship, naming it the 2016 California Golden State Winery of the Year. South Coast Winery brought home the first California State Winery of the Year award to its Southern California Temecula Valley home in 2008 and then followed it up with a back-to-back win in 2009. It earned the top title in the California State competition again in 2013 and now celebrates its fourth win for 2016. Dating back to 1854, the California State Wine Competition premieres only wines made with fruit grown in California; and there were 2,854 wines judged from 750 of the state’s top wineries during this year’s competition. “South Coast Winery is truly honored to be bringing this recognition to Temecula Valley Wine Country, especially with only 13 years of wine production. This award is a reflection of the dedication and the collaboration between our soil and vines, the vineyard team and our talented winemakers. I’m humbled to be a part of it,” states Jim Carter, the owner/vintner for the Southern California winery resort. Congratulations to Mr. & Mrs. Carter and the entire South Coast Winery team! Posted in Winery News | Comments Off on Temecula Valley Winery named California Winery of the Year! Who’s as obsessed with Thanksgiving as we are? The turkey, the trimmings, the pumpkin pie and the WINE! This is the time of year we get the most questions about wine pairings. While there is no “right” or “wrong” wine to pair with your feast, there are a few varietals that, if paired with your favorite dishes, will send your taste buds into sensory overload. We’re reprising this “oldie but goodie” Thanksgiving wine guide and have updated it with some suggested pairings to try this year. 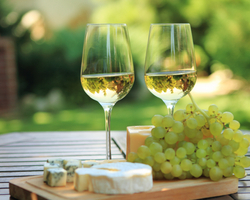 These mellow whites pair well with lighter dishes to kick off your Thanksgiving meal. 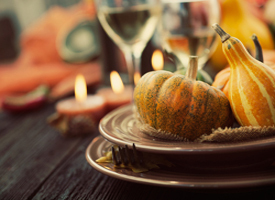 The floral notes of a Viognier complement a fall salad of pears, blue cheese and walnuts; a selection of fruit and cheeses match nicely with a Chardonnay; and a light Pinot Grigio will pair well with your pumpkin soup. The spicy notes derived from these unique wine grapes pair especially well with stuffing and gravies seasoned with holiday herbs like sage, thyme and rosemary. Having a vegetarian Thanksgiving? These wines work well with earthy mushroom and winter squash dishes too! Your Thanksgiving meal isn’t complete without dessert, and no dessert is complete without wine – at least that’s how we feel! Apple pies and pear tarts are practically made to pair with a sweet Moscato, where red delicious apples, kiwi, pears, and apricots come together nicely with honeysuckle and jasmine undertones. Oak Mountain’s Port has a nutty honeyed flavor to perfectly complement the nutmeg and allspice flavors of pumpkin pie. On a wine-buying budget? Or just looking to simplify your evening by serving one wine from start to finish? Any of these three, well-priced wines fit the bill. Each is lighter on the palate, with only subtle hints of sweetness making them suitable to drink from appetizers all the way to dessert. Bon appetit! Spring has officially arrived! 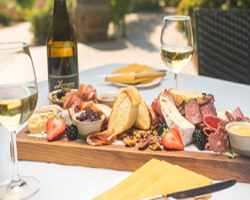 We invite you to come out to wine country and enjoy Easter Brunch, take in a concert or comedy show, or simplywind down with a glass of wine and live music. Sunday, April 5 / 11:30a-3:00p / Regular menu, plus a few Easter specials. 2nd Annual Dog Easter Egg Hunt at 1:00p. Dogs will be hunting for plastic eggs filled with turkey hot dogs. Live music by Lenny Hansell, local Idyllwild musician. Meritage at Callaway will be featuring an a la cart, brunch inspired menu from 10:00a-4:00p. Travel around the world with us and experience a different wine region every month. Savor and compare the varietals that best represent a particular region paired with a special selection of Tapas typical of that region. This month, enjoy a wine flight of 3 wines from South America for $15. Thursday, April 2 / 6:00p-9:00p / A creative life needs to be lived out in the OPEN; heard and shared with others. Join us for an evening of tapas, wine & creative collaboration. We will provide the stage, you provide your words, your unique sound and your talent. Come early to sign up. Call (951) 587-8889 or email stefano_butto@callawaywinery.com for more information. Sunday, April 12 / 3:00p-6:30p / Join us for a fun-filled afternoon of food, wine and culinary entertainment in our clubhouse. $60 per person; Wine Club $54 per person. Thursday, April 23rd / 6:00p-10:00p / Reserve the date for a fun evening event with DJ, dancing, food wine and more! Open to Wine Club, Industry and public. Free cover or $30 (2) for reserved table. Friday, April 17 / 6:00p-10:00p / Enjoy a night of Leoness wine, live music and hors d’oeuvres as we showcase the works of Erin Hanson. A portion of the art sales will go to benefit the Our Nicholas Foundation, which supports those diagnosed with Autism and their families. There is no cost for the event, however it is an exclusive event and therefore RSVP is required. RSVP to Alexandra@leonesscellars.com. Friday, May 8 / 4:00p-6:30p / Members $45; Non Members $49 / Sip along with our team of expert farmers, winemakers and Master Sommelier, Eddie Osterland, as they share their anecdotes and insights into wine production – from seedling to bottle. Tasting and discussing a variety of exclusive Leoness Syrahs not available in our tasting room. Pre-purchase tickets online at www.leonesscellars.com. Friday, April 17 / 6:00p / An interactive and entertaining art experience! Enjoy Lorimar wine while painting a beautiful picture. / $60 per person; $55 per person, wine club. Price includes one glass of wine, small bites and all painting materials. Tickets available online, in wine country, Old Town or by phone at 951.694.6699. Thursday, April 23 / 7:00p / Join us for a night of comedy as we bring you talented comedians that will make you Laugh Your Glass Off! / $35 per person; $30 per person, wine club. Tickets include one glass of wine. Mature audience only. Tickets available online, in wine country, Old Town or by phone at 951.694.6699. Monday, April 27 / Sunset / Free admission; wine and concessions available for purchase. April 9, 12, 28 / 12:00a-3:00p (April 12th class is 1:00p-4:00p)/ $45 per person – includes a glass of wine! (Discount given for multiple guests) / To sign up or for more information, please contact Dorothy Hawthorne at 951-302-3088 or doughawthorne@verizon.net. Bubbles 101 – We want to burst your bubble with our champagne class / Oak Mountain Winery’s Sparkling Wine Class will have you taste three of our handcrafted sparkling wines made and bottled here in Temecula. You will be served 3 of our sparkling wines paired with artisanal cheeses. Learn fun facts you always wanted to know about sparkling wines and champagne. Blending Reds – Create, bottle and label your very own blend / In our Blending Class, you get to be the Winemaker! You will be supplied with three of Oak Mountain’s red wines, Cabernet Sauvignon, Cabernet Franc and Merlot, tasting notes, a measuring flask and pipette, three wine glasses for sampling your creation and a “cheat sheet” provided by our own winemaker to help you with the process. You will have the option to bottle your custom blend of wine for an additional $29. We will then pop in a cork and add a personalized label and you’ll take home wonderful memories – as well as a one-of-a-kind bottle of wine. Wine Tasting for Dummies 101 / Our beginners class for Wine Tasters. This is a good class to take if this is your first visit to a winery and want to know the basics of wine tasting. You will taste three wines paired with delicious gourmet cheeses and dark chocolate toffee. You will also get to sample eight of our infused Avocado Oils and Balsamic Vinegars that are only available at Oak Mt. Winery. Rhone Wine Class 201 / Our second, more advanced class after taking Wine Tasting 101 is our Rhone Wine Tasting Class 201. Learn how these grapes are grown here in the valley and how wine is made, while tasting varietals from different areas in the Rhone region of France. Just like the 101 class, you’ll get 3 wine tastings and 8 tastings of Avocado Oil and Balsamic Vinegars. Bordeaux Wine Class 201 / You will learn how these grapes are grown and how they are harvested and processed, while tasting Oak Mountain wines from different areas in the Bordeaux region of France. Just like the 101 class, you will get 3 wine tastings and 8 tastings of Avocado Oil and Balsamic Vinegars. We recommend that you have taken our Wine Tasting 101 class prior to this course. For those who truly love to dine, South Coast Winery Resort & Spa’s culinary team offers a front row seat into their world with a special “Chef’s Table Dinner”. The Vineyard Rose Chefs create a custom five-course menu just for you. Our expert Winemakers then pair each course with our award winning wines to heighten the dining experience to another level. Whether it’s a special celebration or an intimate affair, our Chef’s Table dinner for 2 to 8 guests will define the art of fine cuisine with a memorable evening of food and wine for only $135 per person. Call 951-491-8077 to reserve your table today. Monday-Friday 3:00p-5:30p / Join us in the Vineyard Rose Lounge for reduced priced selected appetizers, award winning select glasses of South Coast wines and local drafts. PLUS corkage fees are waived for any South Coast Winery wine bottles brought in to the Vineyard Rose Restaurant and consumed while dining on Wednesdays too! Visit www.WineResort.com to view menus and find out more. Friday, April 3 / 6:00p / A vertical tasting dinner of several past Crowded vintages and the brand new 2013 Crowded. We will be pouring and presenting four vintages of Crowded all on the same night! At this event, you’ll taste our 2010, 2011, 2012 and the brand new 2013 Crowded along with food pairings. All of these past releases will be available for purchase at the event. Saturday, April 11 / 6:00p / The word from the bird is that we decided it’s time for a good old fashioned 1950’s spring fling dinner and dancing night! We encourage you to come dressed in your primo cool cat and foxy attire for a night of fab food, wine and music. It’s going to be a gas! Sunday, April 5 / 10:00a-3:00p / Brunch buffet $49.95, per person / Wine Club $44.95, per person / Children $14.95, per person / Brunch buffet with sparkling wine $59.95, per person / Wine Club $53.95 per person / Reservations required by calling 951.699.9463. Saturday, April 18 / 11:00a-1:00p / $35 per person; $25 per person, wine club / These monthly courses are aimed at empowering you in your wine knowledge and experience. Our top notch winery instructors will make your wine experience interactive and interesting with each course highlighting a different topic. Limited space and reservations required by calling 951-699-9463. It’s the start of another new year (again) and if you haven’t visited Temecula Valley Wine Country lately, now’s the time! There’s never a dull moment in wine country, and this time of year is no exception. Check out the wine country calendar of events and make plans to visit us soon! Thursday-Sunday / 11:00a-2:30p / Tours and vertical tasting of library Cabernet Franc. Sit down with bread and cheese plate; $30 (Reservations required 24 hours in advance) / Bar Tasting; $20. Call for reservations: 951-972-9768. Entire month of January / A sale on all current vintages to make room for the 2014 whites and rose and the 2011 reds. Visit or call the winery for details. Every Friday at Meritage from 5pm-8:00pm in the main dining room. Enjoy a three-course Prime Rib dinner for $35 per person! Choose from soup and salad, a scrumptious Prime rib entree and finish with a house made Crème Brulee for two! A special wine discount of 20% off Callaway wines by the bottle is available throughout the evening. Vini Contreas performs live in the main dining room every Friday beginning at 6pm and continuing throughout the evening. Reservations are not required. No cover. Cannot be combined with any other offers, including wine club member discounts. Thursday, January 8 / 6:00p-9:00p / A creative life needs to be lived out in the OPEN; heard and shared with others. Join us for an evening of tapas, wine & creative collaboration. We will provide the stage, you provide your words, your unique sound and your talent. Come early to sign up. Call (951) 587-8889 or email stefano_butto@callawaywinery.com for more information. Saturday, January 10 / 1:00p-5:00p / Wine specials throughout the day. Special wine cocktails. January 7, 22, 24 / 11:00a-2:00p / January 24th class is from 12:00p-3:00p / $45 per person – includes a glass of wine! (Discount given for multiple guests) / To sign up or for more information, please contact Dorothy Hawthorne at 951-302-3088 or doughawthorne@verizon.net. Saturday, January 17 / 6:00p-9:00p / Come join us to celebrate our 9th anniversary party for Oak Mountain Winery. Dinner, wine and live music by Rhandi & Associates. Call 951-699-9102 for more details. January 18-24 / A whole week dedicated to tantalize your senses! We’ve tasked each of our resort’s departments to create a special celebration dedicated to the Art of Wine! Come out any day of the week to enjoy all that we have to offer! Visit www.wineresort.com or call 800.539.1375 for more information. Friday, January 30 / 7:00p / A one of a kind dining experience! An interactive Chef’s table in a private kitchen, where you will dine one-on-one while the chef prepares your five course meal right in front of you. Seating is limited to 10. Reservations are required by calling 951-699-0099.